The safety and well being of the kids at our day care is our primary responsibility as providers. We are not however merely babysitters, nor referees at some chaotic miniature wrestling event (though often times it feels that way) but facilitators, entrusted with the important task of nurturing and developing the whole child. Encouraging creativity and imagination is a vital aspect of this facilitation role. Opening the door to various creative outlets will ensure that children will lead a richer more complete life. Here are some pointers on opening those doors. Expose kids to the arts, culture and beauty whenever possible will help them to grow to appreciate and recognize same. Organize short visits to the local art gallery, museum, library and view various types of art. Try to arrange trips to see plays or musical performances, simply play different types of music at the day care and get the kids moving and dancing. Encourage creativity in cooking activities, playing with sand or water, arrange nature walks and point out the natural beauty that exists all around us. Read and encourage reading. Have a vibrant lively story time involving made up stories that ramble and grow thus leading into miniature dramatic plays. Anything goes. A love of music is naturally inbuilt into kids. Improvising with whatever is available get the musical instruments out and let the orchestra loose. Begin having theatrical, singing workshops that breathe life and vibrancy into songs. Remember to praise all artistic attempts no matter how off the wall it appears to you personally. Creative play tends towards the messy end of the scale….let it be so. Order is not a concept that sits well with creative spirits so, difficult though it may be to see your impeccable playroom descend into chaos, try to rise above it. You can attempt to minimize some of the damage by using aprons, laying newspaper or spreading a tarp. Let them off with their creative processes and don’t try to direct their efforts. Every work of art is personal and meaningful and should be the direct result of freedom of expression, even for toddlers. Ask questions, encourage discussion, help with a particular process should they ask and never criticize. The benefits of creative and imaginative play are many and wondrous. Children feel unthreatened in imaginary situations and are more likely to experiment with their verbal skills. Role play can encourage them to express worries or fears and can also thus leading to active problem solving. 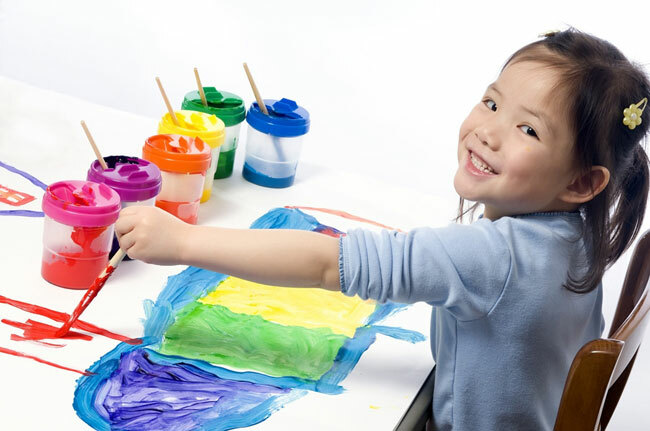 Creativity can help unlock hitherto untapped talents leading to increased confidence in a child. Most importantly, boredom becomes a thing of the past when the magical kingdom of the imagination has been unlocked.